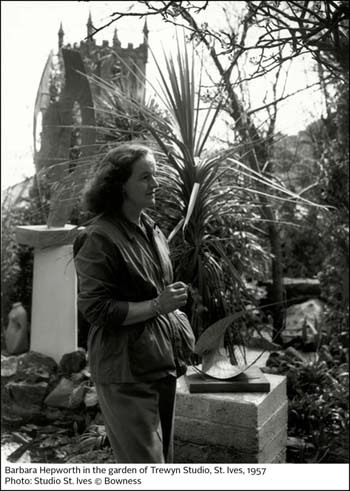 Barbara Hepworth was one of the most acclaimed and beloved sculptors of the twentieth century. Hepworth keeps company with the A-list of innovators in this genre, including Hans Arp, Constantin Brancusi, Alberto Giacometti, Louise Nevelson and especially her countryman Henry Moore. Her work has been exhibited and studied extensively and is the focus of a current retrospective at Tate Britain in London, England. While Hepworth’s reputation garnered her large public commissions, her inclination was to sculpt on an intimate scale. She was most interested in - and explored profoundly - the interactions that her abstract forms made possible with a specific viewer. Although it is correct to think of Hepworth’s sculpture as abstract, her creations were always decidedly of this world, in that they were inspired by familiar forms such as seashells and rocks. Above all, she made reference to the human body. 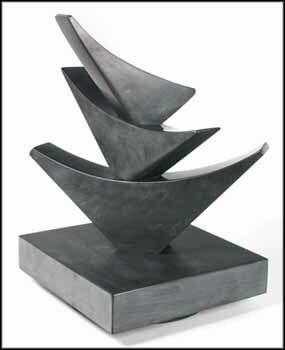 "Sculpture,” Hepworth said in a 1959 interview, “communicates an immediate sense of life – you can feel the pulse of it. It is perceived, above all, by the sense of touch which is our earliest sensation; and touch gives us a sense of living contact and security.” The all-important sense of touch underlines Hepworth’s lifelong praise of carving as the sculptural technique most attuned to its materials and to the corporeality of artist and audience alike. That sculpture augments our perceptual faculties is joyously evident in Three Forms (Three Horizontal Curves), from 1969. It is a small sculpture whose large presence is assured by several factors. First, refinement of form and technique. Slate is an unusual material for a carved sculpture; we do not see it in lists of stones typically preferred by artists. Hepworth embraces the challenge of this material, exploiting its potential for tapered forms and a lustrous, matte finish. The presence of Three Forms is also realized by the subtlety with which Hepworth articulates and distinguishes its horizontal elements. For example, the exquisitely tapered edges of the middle of the three wing-like forms is especially true to the angularity that we associate with slate, but Hepworth also delicately shows its softer, more malleable side. Thus if we look from an angle where the top form is facing us and the sharply tapered edges of the middle form are most evident, we can easily see and touch the rounded “nose” of the top form, in contrast to the fine edge to the right. Crucially for our eye and for our sense of touch, each of what we might well see as the three bird-like forms is turned on a different angle on the heavier, grounding base of the sculpture, giving a sense of motion even as we stand still. The base is indeed the ground or the earth. It is assertively square, in contrast to the three upper forms, which read as triangular and, in their relative lightness, as soaring aloft. 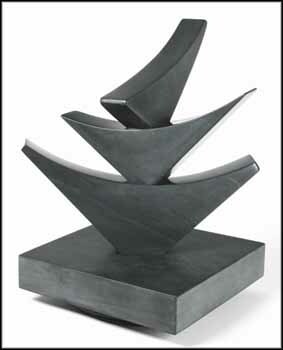 The sculpture’s luxurious surfaces also reflect light in a particularly rich way, with the effect that abstract echoes of the base and the three forms appear as abstract shapes on the bottom edges of each element, darkening these surfaces and adding subtle contrasts to our repertoire of visual experience. While this captivating sculpture encourages personal reveries, Hepworth’s work is never ultimately self-absorbed or solipsistic. Here, as in all her sculptures, the individual context should expand to join with larger considerations. She has asked, "What is the meaning of sculpture? Today when we are all conscious of the expanding universe, the forms experienced by the sculptor should express not only this consciousness but should, I feel, emphasize also the possibilities of new developments of the human spirit, so that it can affirm and continue life in its highest form.” That Hepworth expressed this aspiration over 50 years ago does not in any way diminish its relevance today, but instead attests to the enduring nature of her work. We thank Mark Cheetham, Professor of Art History at the University of Toronto, for contributing the above essay. We thank Dr. Sophie Bowness for providing information in preparing this catalogue entry. 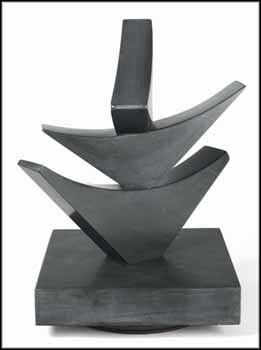 Bowness is preparing the revised catalogue raisonné of Hepworth's sculpture, in which this work is included, as BH 480. Consignor proceeds from the sale of this lot will benefit the Montreal Children's Hospital Foundation.